Join us for a drive to Campo where we will have a picnic and go on a train ride. We will start the group drive from the parking lot of the Edwards Rancho San Diego Cinema. It is about two miles east of where route 94 stops being a freeway. The drive is about 70 miles round trip from Rancho San Diego (range miles a little less). An alternate return route via I8 is a few miles longer but possibly faster depending on where you live. 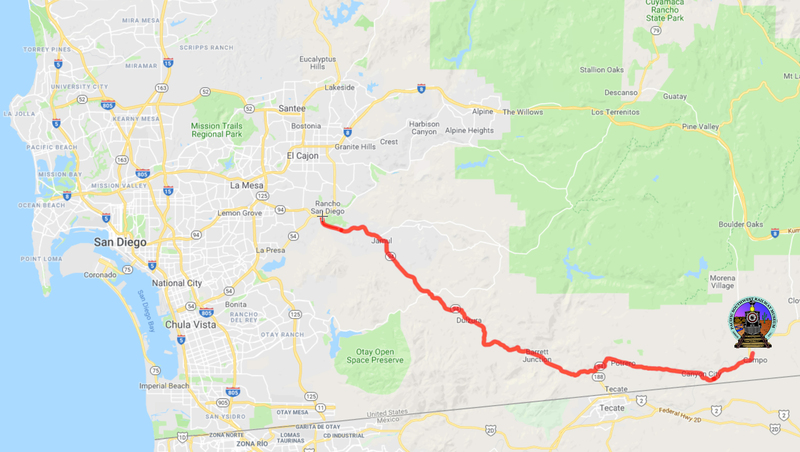 The drive will take us on an old time two lane (winding) road that at one point dips to within a few hundred yards of the border with Mexico. Some may want to make a two mile side trip (on the return) into Tecate for Cinco de Mayo supplies. Also at Campo is the southern terminus of the Pacific Coast Trail if anyone is interested in a hike (the other end of the trail is at the Canadian border). This is where Reese Witherspoon started her trek in the movie Wild. There is a picnic area, but it can’t be reserved. We suggest that people bring a camping table if you have one, and camping/beach chairs in case the picnic area is full. Members should bring a dish (with serving utensil) to share, plates and silver/plastic ware, and their beverage of choice. We plan on taking the 1:15 train ride. The cost is $18 (adult), $15 (senior) or $9 (child). Tickets can be purchased on-site or in advance. Visit the museum web site for full information. Feel free to add any ideas or suggestions.